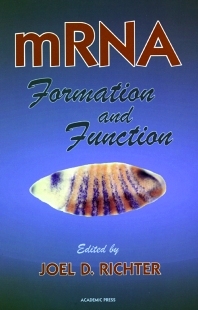 mRNA Formation and Function presents a compendium of techniques geared exclusively toward the understanding of RNA metabolism. It will be particularly useful because a number of different organisms and systems are employed. C. Sune, P.R. Bohjanen, Y. Liu, M.A. Garcia-Blanco, and S.F. Jamison, The Tat-TAR RNP, a Master Switch That Regulates HIV-1 Gene Expression. C.R. Miller, S.F. Jamison, and M.A. Garcia-Blanco, HeLa Nuclear Extract: Amodified Protocol. J. Valcarcel, C. Martinez, and M.R. Green, Functional Analysis of Splicing Factors and Regulators. J.G. Patton, B.T. Dye, D.C. Barnard, and J.G. McAfee, Identification of pre-mRNA Splicing Factors and Analysis of RNA-Protein Interaction. G. Gilmartin, In Vitro Analysis of Mammalian Cell mRNA 3 Processing. J. Wilusz, Rapid Identification and Cloning of Sequence-Specific RNA Binding Proteins. J.S. Butler, M.W. Briggs, and A. Proweller, Analysis of Polyadenylation Phenotypes in Saccharomyces cerevisiae. P.D. Gershon, Poly(A) Polymerase/cap-Specific 2-O-Methyltransferase from Vaccinia Virus: Expression, Purification, Uses, and Protein-Ligand Interaction Assays. A.N. Hennigan and A. Jacobson, A Genetic Approach to Mapping Coding Region Determinants of mRNA Instability in Yeast. W.F. Marzluff, M.L. Whitfield, Z. Dominski, and Z.-F. Wang, Identification of the Protein Which Interacts with the 3 End of Histone mRNA. M. Holcik and S.A. Liebhaber, Analysis of mRNP Complexes Assembled in Vitro. A. Laird-Offringa, Analysis of RNA-Binding Proteins Using in Vitro Genetics. L.G. Andrews and J.D. Keene, Interactions of Proteins with Specific Sequences in RNA. C. Jain and J.G. Belasco, A Rapid Genetic Method for the Study of RNA Binding Proteins. P. Ansel-McKinney and L. Gehrke, Footprinting RNA-Protein Complexes with Hydroxyl Radicals. H. Ruan, C.Y. Brown, and D.R. Morris, Analysis of Ribosome Loading onto mRNA Species: Implications for Translational Control. G. Belsham, Analysis of Picornavirus Internal Ribosome Entry Site Function in Vivo. M.R. Jacobson and T. Pederson, RNA Traffic and Localization Reproted by Fluorescent Molecular Cytochemistry in Living Cells. A. Manoukian, Detection of mRNA in Situ: Techniques for Studying Gene Expression in Drosophila melanogaster Tissues. M.H. Jacob and O.C. Ikonomov, Differential Display Protocol That Preferentially Identifies mRNAs of Moderate to Low Abundance in a Microscopic System. Subject Index. Worcester Foundation for Biomedical Research, University of Massachusetts Medical Center, Worcester, U.S.A.